Bloomberg writers, whether by lack of curiosity or adherence to the party line, refused to looked at the issue from another perspective. They never question is it right for women, or anyone, to possess that kind of capacity for destruction. All they care about is equality, even if that equality means access to the tools that sow that destruction. Activist investing, if you’re not familiar with the term, refers to a practice of taking over the management of an existing company, stripping it of any value, firing its employees and then bragging to shareholders about ‘efficiency’. Complaining about the lack of women in that kind of position is like complaining about Jeffrey Dahmer (the serial killer) not hiring female assistants. This article reminded me of another short-sighted lament in business circles about the lack of women at World Economic Forum at Davos. Cathy O’Neil (mathbabe) made a good point about it earlier this year. Why, instead of pointing out the corruption on modern-day business elites, one encourages women and minorities to join them? Is it because the task of defending the indefensible becomes easier when it is done by a few strategically placed blacks, women and gays? Does it absolve the old white rich guys who are pulling the strings behind the scenes, when they can point at ‘diversity’ at their control panel? No one questions the price of that kind of ‘equality’. I once heard an adage about the difference between white and black women. It said that white women seek equality; black women seek justice. Indeed, white women strive to get into that corner office so that they, too, can plunder the world like the guys did for centuries. Black women, on the other hand, can smell a rat here, and thus reject the entire system that only perpetuates the injustice. Like planets or a light beam that are at a safe distance from a massive gravitational object, they are uncorrupted by its gravitational force. White women, on the other hand, usually are. Thus black women, unlike white women, are under no illusion about this whole corrupt scheme. Just some food for thought. Joanne Bland, a local Selma woman. Selma was not in my original plans, but I decided to make a detour there on the way to Montgomery and it was one of the most interesting parts of the trip. 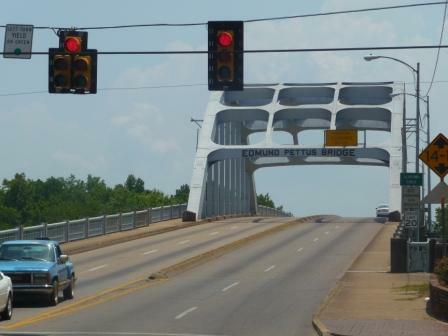 Selma was a site of 1965 civil rights marches from there to Montgomery. On the day that became known as “Bloody Sunday” a bunch of marchers were attacked by police as they tried to cross the Edmund Pettus bridge. As I rolled into town, and it’s a very small town, you can’t really get lost in there, I ended up right at the foot of that infamous bridge, which is where I parked my car. The electric tableau on some local bank branch showed 103F degrees. The place was, already predictably, quite dead. I thought just a few quick pictures and I’m outta here. But just as I thought that, I saw a small group of protesters near the bridge and decided to check it out. I thought wait a minute, protesters in Selma in 2010? Could it be that the time stopped there? I proceeded towards them.